A new and easy way to purchase KTM ticket is finally here! Easybook is proud to introduce the Pre-Book KTM Tickets system on the website where you can now conveniently book KTM tickets in advance without having to queue up at the ticket counter. The pre-booking feature is currently available on Johor Bahru-Singapore or Singapore-Johor Bahru only. FIXED: Non-Flexible (We will refund you in full amount if ticket(s) is sold out). Once your booking is confirmed, you will receive the E-ticket through email. On top of that, Easybook also guarantees a safe journey for all your travels with its insurance policy. Insurance will be purchased for you once your ticket booking has been successfully made. However, the insurance fee is refundable if your booking fails to get through the system. Please note that you are unable to request for a refund once the insurance is purchased. 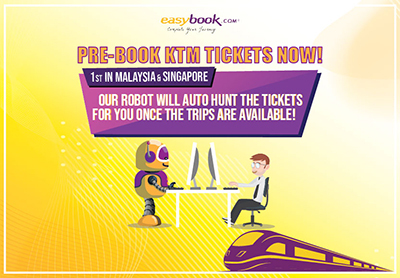 Grab this chance to pre-book your KTM tickets conveniently with Easybook now! The reservation period is within 25 days before departure date. All successfully issued ticket is non-changeable and non-refundable. Tickets are 100% refundable (including ticket fare, insurance and pre-book charges) if the company fails to issue the ticket to the customer within the reservation period. The service is for one-way trip booking only. Two-way trip is not available. Discount code and Easipoints are not applicable for this service. Route booking for Shuttle Train is 30 days – 1 year in advance; Route booking for ETS and intercity train is 60 days – 1 year in advance. Subject to actual release time from the supplier. Tickets successfully issued are non-changeable and non-refundable. Ticket fares and reservation fees are refundable upon failure for reservation. The booking will be handled as per first-come-first-serve basis and subject to seat availability.